It appears there has been a hit put out on one of the gnomes. He was found near his post with both legs broken and a cracked head. I do not know at this time who is responsible but it’s obvious there is a new faction involved. Here is a photo of the victim. You can clearly see the injuries he sustained. 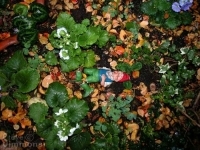 It is unknown whether or not he will return or if this will leave a hole in the gnome lines. I will be keeping an eye on the other gnomes for signs of movement to fill the gap in their defense. Updates to come as they are available!